A supermarket in an industrial production site is the location where a preset standard inventory is kept to supply downstream processes. Supermarkets are strategically located on the production floor to create small stockrooms; each item in a supermarket has a specific location from which a worker picks products in the precise amounts needed by a downstream process. One of the eight wastes according to the Lean Manufacturing philosophy is transportation time. Supermarkets nearby where the components are needed to reduce transportation time between the production line and the storage area. 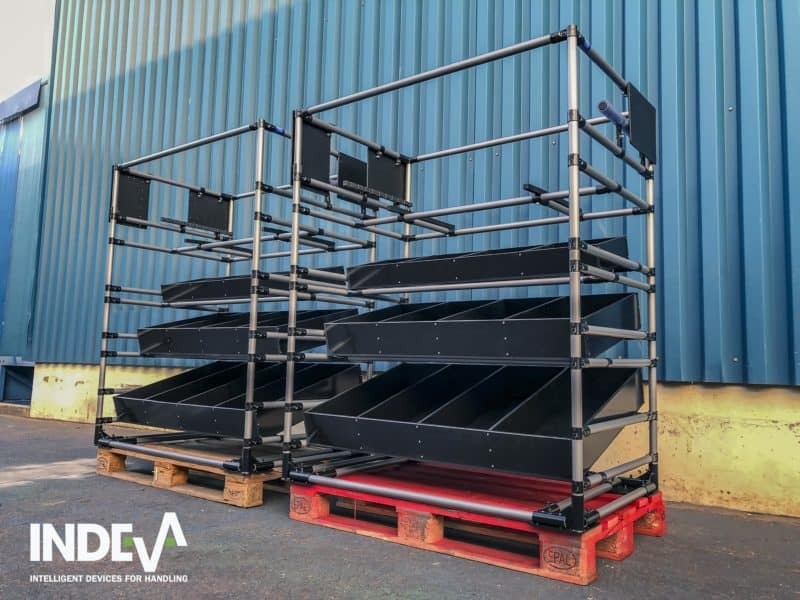 The use of modular supermarkets with adaptable trolleys and carts specifically designed to carry specific items in a specific quantity to the line side, helps eliminate waste; moreover the adaptability and flexibility of modular structures supports continuous improvement because modifications can easily be made when needed, so reducing wasteful processes. A supermarket close to the production area also cuts down on forklift traffic and on the space used for carrying around large pallets or containers. Elimination of safety hazard from forklift traffic is another advantage of having supermarkets positioned at the line side. A valuable saving of time and space, indeed!